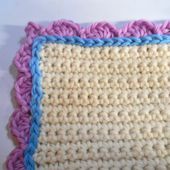 The shell stitch has been a popular crochet stitch for well over a hundred years, and it's still going strong. There are all kinds of things you can construct using shell stitches, but borders, edgings, and trims top the list as being some of the most popular things to make with them. Why are shell stitch borders so popular, you might ask? Well, the simplest of the shell borders are quick to crochet, and they're super easy; many of them are beginner-friendly. Also, the shell stitch is well-suited to making pretty scalloped designs, so it's a no-brainer to use shells as trims and edgings. If you'd like to find free patterns for crocheting shell borders, this page is a great place to find them. The instructions for this edging include several different options for working corners and adding colors. If you work from one of the versions featuring corners, as pictured, the pattern works well for finishing off blankets, pillows, dishcloths, and other square or rectangular projects. The shells in this edging are worked using treble crochet, and as a result, they are taller than usual. Also, this edging is crocheted using two different yarn colors so that the shells appear to alternate. This makes an eye-catching edging for ​baby blankets, afghans, pillows, and just about any other type of project where you might want to add a pretty scalloped border around the edge. Copyright Notice: This page, plus the photos and patterns on the page, are copyrighted. If you want to share any of our patterns or resources with a friend, please scroll up to the top of the page and use the "share" button at the top right-hand side of your monitor to do so. You are also welcome to link to this page, or any page on our website if you like. Please know that we appreciate all links to our pages -- thank you! However, we ask that you please do not copy the page or any of its contents to another website, or to Internet groups, forums, chat rooms, etc. Instead, please send people to our website so that they can benefit directly from all the resources we have posted. Thanks for Visiting! We really appreciate your interest in our patterns.